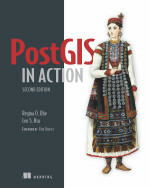 Well happy Friday to all of us, I have a 50% off code for PostGIS in Action, Second Edition! Between now and January 22nd, use pgislaunchau and get 50% off the price of the book. It also includes a free ebook of the first edition to tide you over. Let’s face it, PostGIS is the defacto choice for most GIS people and this is the bible to make you proficient. Don’t hesitate, the 22nd is right around the corner.